Over several decades, Conviron has established a global reputation within the plant science community for its leadership in controlled environment systems. We maintain a comprehensive portfolio of products including reach-in chambers, walk-in rooms, and full-scale, high performance research greenhouses. In addition to our extensive portfolio of standard products, Conviron also offers a host of configurable options and engineered modifications. A list of our most common preconfigured options are featured. For our complete offering of options and customization, contact Labconsult. The A1000 plant growth chamber offers the unique ability to adapt to four different research applications in an economical equipment platform. The base chamber itself can be fitted with one of four specially configured kits. 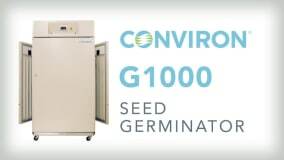 The G1000 is specifically designed for consistent, uniform seed germination.